These translucent magnetic shapes continue to enjoy iconic status. 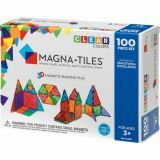 Every square and triangle attracts on all sides with magnets along it's edges, inviting little builders to use their imaginations, or follow the guided instructions. Creativity, sequencing, patterning and logic development are built right in. Learn about color, shapes, symmetry, and scale.